Five-star Doncaster Rovers produced their best performance of the season to dispatch struggling Rochdale and start 2019 in the best possible fashion. Alfie May scored after just 40 seconds, Ali Crawford curled home a sensational free-kick and John Marquis headed home to put the game beyond Dale before the break. Marquis and substitute James Coppinger struck in the second half to seal Rovers’ eighth win in 11 games. 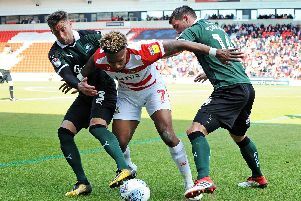 Doncaster’s comfortable victory saw them move back into the play-off positions at the expense of Peterborough United who suffered a surprise home defeat to Scunthorpe United. Rovers have been adept at dealing with the lesser lights in League One this season and, prior to this game, had taken 30 out of a possible 39 points against teams occupying bottom half positions. And it was a case of more of the same at the Keepmoat Stadium as Grant McCann’s in-form side turned on the style to blow Rochdale away with some scintillating attacking play. Confidence was sky high throughout the Rovers ranks and that was in stark contrast to a Rochdale outfit coming off the back of a 4-0 home defeat to Bradford City on Saturday. Rovers were not only incisive and creative in the final third but they swarmed all over Keith Hill’s men to stop them gaining any sort of foothold in the game. Leading 3-0 at the break, the tempo understandably dropped in the second period but Rovers still added to their score and defended diligently at the other end. Rovers seized the initiative with their very first attack. Man of the match Mallik Wilks did excellently down the right before crossing for an unmarked May to guide a header past Magnus Norman into the far corner. Wilks, fresh from signing a new deal at parent club Leeds United and extending his stay at the Keepmoat Stadium until the end of the season, was really in the mood and had his full back on toast. His inswinging cross was glanced towards goal by Marquis and only a good reaction stop by Norman prevented Rovers from doubling their lead after just three minutes. Minutes later, with the home side exuding confidence, Wilks waltzed into the penalty area and a strong hand from Norman kept out his powerful left foot effort. Rochdale briefly stemmed the tide but they had not weathered the storm. Yet more trickery from Wilks saw him fouled just outside the box and the resultant free-kick was curled home exquisitely by Crawford after 23 minutes. Ten minutes later the game was over as a contest when a free-kick routine straight from the training ground led to Ben Whiteman crossing for Marquis to plant a header past Norman. Rathbone shot narrowly wide at the other end but the visitors were fortunate to go in just three down after Crawford caused havoc with some sumptuous set piece deliveries. Dale enjoyed more possession and territory after the break but their best efforts, from Rathbone and Ian Henderson, were dealt with by Rovers goalkeeper Ian Lawlor. May tried an acrobatic attempt for the hosts and Crawford came close to a fourth with a clever chip. Marquis did extend the lead when he let fly from range and Norman let it slip through his fingers. Coppinger came off the bench to add the gloss by meeting Matty Blair’s cross with a diving header. ROVERS: Lawlor, Blair, Anderson, Butler, Andrew, Whiteman, Kane (Rowe 66), Crawford (Taylor 83), Wilks, May (Coppinger 66), Marquis. Subs not used: Marosi, Amos, Lund, Boocock. ROCHDALE: Norman, McGahey, Delaney, Williams, Ntlhe, Morley (Andrew 46), Done, Rathbone, Adshead (Inman 46), Camps (Gillam 76), Henderson. Subs not used: Lillis, McNulty, Williams, Gillam, Matheson.